The culmination of the 2018 NFL season brings with it the final iteration of The Stats To Know series by Nathan Jahnke, PFF’s Director of Analytics, finding an interesting piece of information about all 32 teams after 17 weeks of football. If you would like to make some observations of your own, you can do so with PFF Elite, where you can find several signature statistics for every offensive and defensive position in football, thanks to Premium Stats 2.0. We will have many more interesting facts and statistics throughout the playoffs though, so stay tuned! Buffalo Bills: Since Kyle Williams was drafted in 2006, he has 259 run stops. That is the second-most for all interior defenders during his career. Miami Dolphins: Raekwon McMillian ended the season with 47 run stops, which is eight more than any other linebacker. New England Patriots: When Lawrence Guy lined up on the defense’s left side, he produced 25 run stops. That is third-most for all interior defenders from the left. New York Jets: Over the last two seasons combined, safety Jamal Adams had 54 run stops, which is 11 more than any other safety in that time. Baltimore Ravens: From 2006-2013, Hall of Fame semifinalist Ed Reed had 42 interceptions and 32 pass breakups. His 74 combined interceptions and pass breakups were the most for all safeties in that time. Cincinnati Bengals: Dre Kirkpatrick ended the season with a 44.4% catch rate allowed when lined up on the outside, which was the lowest rate for all cornerbacks. Cleveland Browns: Running back Duke Johnson forced at least one missed tackle on 25% of his carries this year, which is the highest rate among running backs this year with at least 25 carries. Pittsburgh Steelers: On average, James Conner forced 0.42 missed tackles per catch this year, which was the best rate for running backs with at least 50 catches. 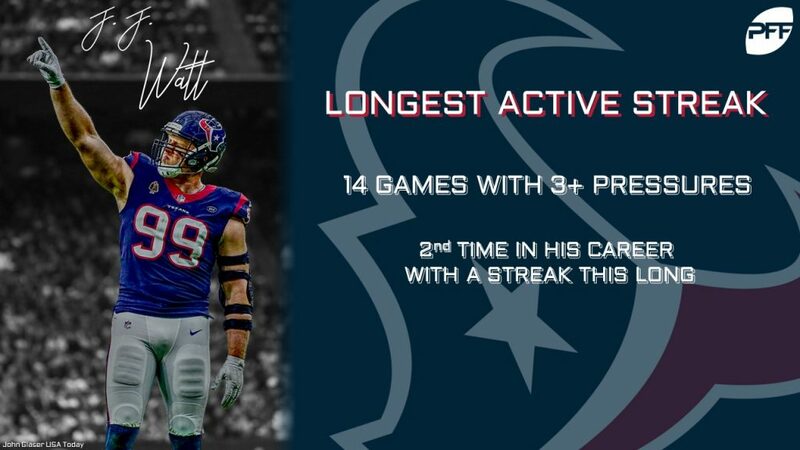 Houston Texans: J.J. Watt has three or more pressures in 14 straight games, which is the longest active streak by four games. It’s the second time in his career he’s had a streak this long. Indianapolis Colts: Rookie guard Quenton Nelson allowed 13 pressures over his first five games, and just 10 pressures over his last 11. He allowed pressure on 2.4% of his pass blocks since Week 6, which is the second-best rate among left guards in that time. Jacksonville Jaguars: Calais Campbell had 43 run stops this season, which is the most for any edge defender in a season over the last 13 seasons. Tennessee Titans: Since being drafted in 2009, Brian Orakpo has 333 pressures when lined up on the defense’s right side. That is second only to Tamba Hali for 3-4 outside linebackers when lined up on the defense’s right over the past decade. Denver Broncos: From 2006-2013, Hall of Fame semifinalist Champ Bailey allowed 0.96 yards per coverage snap, which was third-lowest during that time behind Nnamdi Asomugha and Darrelle Revis among cornerbacks with 3000 or more coverage snaps. 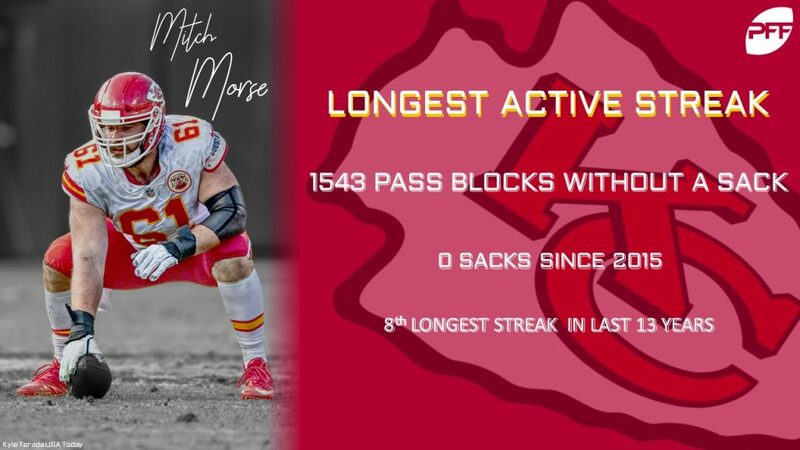 Kansas City Chiefs: Mitch Morse has the longest active streak of pass blocks without allowing a sack at 1543. He hasn’t allowed one since the middle of the 2015 season. His streak is the eighth-longest by an offensive lineman in the last 13 years. 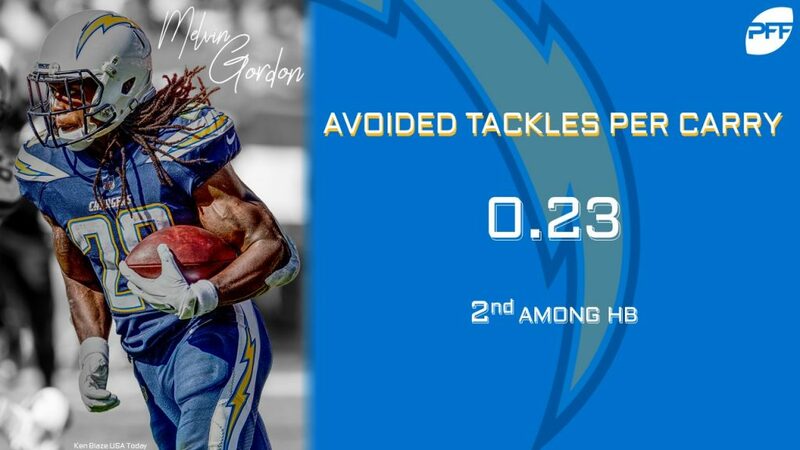 Los Angeles Chargers: Melvin Gordon III averaged 0.23 missed tackles per carry this year, which was second-best best rate for running backs. Oakland Raiders: When Rashaan Melvin lines up on the outside, he has a 3.9% run stop percentage. That is the best rate for an outside cornerback in the last eight seasons. Dallas Cowboys: Left tackle Tyron Smith had six games this season where he didn’t allow a pressure. That was the most for a left tackle this season. New York Giants: Dalvin Tomlinson ends the season with the longest active streak of tackles without a miss with 60. He has only missed one tackle in his two-year NFL career. Philadelphia Eagles: Brandon Brooks allowed his first sack as an Eagle this past week. He had a streak of 1889 pass blocks without a sack allowed which was (and still is) the most for a guard in the last 13 years. He was also one of five offensive linemen this season to allow two or fewer pressures in all 16 games. Washington: Adrian Peterson forced 45 missed tackles on his carries this year, which was tied for the most among running backs. Chicago Bears: Over the last eight weeks of the season, Bobby Massie allowed pressure on 3.5% of his pass blocks, which was the best rate for right tackles with at least 150 pass blocks in that time. Detroit Lions: Over the last five seasons combined, Darius Slay has 48 pass breakups which are second-most for all cornerbacks. Green Bay Packers: Bryan Bulaga has gone 136 straight pass blocks without allowing a pressure, which is the longest active streak for all offensive linemen outside of centers. Minnesota Vikings: Adam Thielen is the only wide receiver over the last two seasons with over 1,200 receiving yards from the slot as well as 1,200 receiving yards out wide. He has 1304 from the slot and 1323 out wide in that time. Atlanta Falcons: From 2006 to 2013, Hall of Fame semifinalist Tony Gonzalez forced 71 missed tackles after the catch, which was the most for a tight end over that period. Carolina Panthers: Over the last three seasons, Ryan Kalil had the man he was blocking make a tackle on only 5.0% of his run blocks, which is the fifth-lowest rate for centers in that time. New Orleans Saints: Since 2006, when tight Benjamin Watson lined up from a tight end position as opposed to in the slot, out wide or in the backfield, he had 25 touchdowns on deep passes. That is tied with Rob Gronkowski and Jason Witten for fourth-most in that time. Tampa Bay Buccaneers: Over the last four weeks of the season, Vita Vea has 13 stops, which is third most for all interior defenders behind Tyler Lancaster and Aaron Donald. Arizona Cardinals: Since joining the Cardinals in 2016, Chandler Jones has 162 pressures when lined up on the defense’s right side. That is the most for edge defenders when lined up on the right in that time. Los Angeles Rams: The longest streak for tackles or assists without a miss for defensive backs are 51. Three defensive backs share the lead, with two of them being Aqib Talib and John Johnson III. San Francisco 49ers: Richard Sherman was targeted on just 7.9% of his coverage snaps, which was the lowest for a cornerback in the last eight seasons. Seattle Seahawks: Duane Brown allowed one or fewer pressures in 11 games this season including each of the last six. His 11 games are the most for a tackle this season.